by Alec Clayton – Return to Freedom is the sequel to The Backside of Nowhere. The story begins where Backside left off — the day of the hurricane that wiped out the little bayou village of Freedom, Mississippi. Malcolm Ashton’s wife and children and Sonny Staples are scrambling to get out of town, while Beulah Booker is riding out the storm with her boyfriend and other friends in the Lawrence family home. Readers of Backside will rememer Malcolm and Sonny as the teenage hoodlums who looted an electronics store during a flash flood many years ago. They’re grown up now. Malcolm works at the Piggly Wiggly grocery store and has his hands full trying to love and nurture an alcoholic wife and three teenage children. Sonny, after spending some time in the state penitentiary, has found Jesus and become an evangelical preacher. And he has an eye for the ladies — the younger the better. Beulah was getting ready to go to college at the end of the previous novel. Now she’s a young, single mother running Little Don’s, the diner she inherited from her father. She’s got her hands full until a unicycle-riding street performer named Marcia shows up to help her. All of these characters end up living in the same condo overlooking the bay, and the ways in which their lives intersect are as stormy as the hurricane from which they are still recovering. 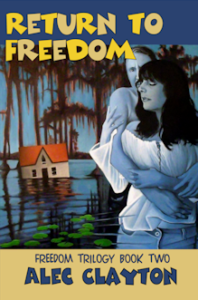 Order Return to Freedom from your favorite bookstore or Amazon.com or CreateSpace.